Hello everyone! 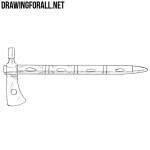 On DrawingForAll we have a lot of drawing tutorials about steel arms, for example lessons about a sword or battle axe. 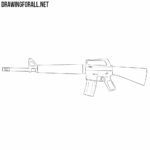 But today we decided that it’s time to start making lessons about firearms and made a lesson about how to draw a sniper rifle. At first sketch out a long stick, which later becomes the barrel of our sniper rifle. 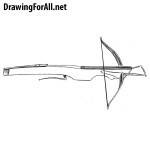 Continue drawing the sniper rifle. Now we draw out the forestock and bipod. Now draw the telescopic sight at the top and outlines of the stock. 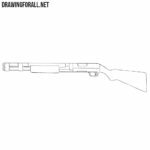 Draw the trigger safety, details of the sight and contours of the stock. 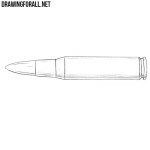 Erase all unnecessary guidelines from the sniper rifle and add final details. 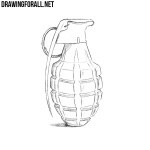 To make the drawing of sniper rifle more realistic add shadows using hatching. It was a lesson about how to draw a sniper rifle step by step. Do you like technology and all sorts of weapons? Then visit our sections “Weapons” and “Cars”, where you will find everything you want.